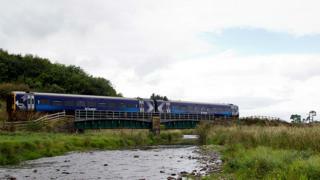 More than four million journeys have been made on the Borders Railway since it opened to customers three years ago. The latest figures show numbers using the line between Tweedbank and Edinburgh have increased every year. ScotRail Alliance Managing Director Alex Hynes said it provided a "strong and reliable" transport connection and boosted tourism, leisure and business. Transport Secretary Michael Matheson said the railway had proved to be a "phenomenal success". The rail line opened to passengers on 6 September 2015 with an official opening by the Queen a few days later. The multi-million pound project included the construction of seven new stations at Shawfair, Eskbank, Newtongrange, Gorebridge, Stow, Galashiels and Tweedbank. Mr Hynes said: "We are committed to building the best railway Scotland has ever had and this line is helping us to deliver that, transforming the way people across Midlothian and the Borders travel. "Reaching the milestone figure of more than four million passenger journeys demonstrates the success of what was an ambitious project and I look forward to its continued growth." Mr Matheson said the route continued to grow in popularity and bring benefits to the local economy. "The ongoing increase in passenger numbers since it opened three years ago demonstrates it is acting as a catalyst for investment while opening up employment, leisure and education opportunities for communities along its length," he said. "We continue to look at ways to develop the potential of the line and the recommendations from the Borders Transport Corridors Study will, in turn, feed into the ongoing Strategic Transport Projects Review." Among the options being explored is the extension of the line to Carlisle which Prime Minister Theresa May said this week could bring "great benefits". However, the railway has not been without criticism since it opened. Service cancellations and delays and the quality of trains being used have both been raised as problems.